Collaborative Project: The Minecraft Community Revamp! I don't like that villagers are so exploitable they are made into slaves either. I was just suggesting this in case someone got mad that we removed that. It gets too a point when it becomes too modular. When Mojang created villagers, I don't think they intended on players enslaving them for breeding. Sure its a style of game, but it wasn't intentional. I like the concept of "NPC players" to an extent... though it begs the question of what exactly they're good for. If you can just gain their trust and take over their house for the most part, you can easy-mode your way through; and unlike villages, which are periodically menaced by a variety of threats, this would be basically risk-free. That, and some people like the concept of being the "sole human". It warrants further discussion. I think a compromise would work: villager "breeders" would still function, but would need changes to their system, ultimately making them seem more like an apartment complex of sorts at the end if each villager had their own bed/enough space/whatever we'd choose to determine whether they'd want to breed or not, rather than the clustered factory-farm pens that current breeders look like. The Update Civilis contains several pieces designed to reduce villager slavery: they don't trade if they're bricked into their house, they try to do their job to get resources to trade, they have hunger needs and try to cover this (with a primitive "economy" system of sorts working), and ultimately they're more useful if you keep a village healthy and active rather than a single open-air room filled with doors, torches, and iron golems. Unrelated: from the discord, Theukon-dos proposes a great idea related to leads connecting between blocks: ziplining. Craft an arrow with a lead, it's now a roped arrow. Shoot it at something with a Bow, right-click with the other end in your hand to place the other side down, use a tripwire hook to zip down the rope pulled by gravity. Craft more leads with the arrow to increase its length (same as adding fuse time to a bomb). Yet another good reason, I see, to carry a Bow even if you've reached later-game and people are toting gunpowder weaponry. I've always really liked the idea of zip-lines ever since I saw the (very) old mod for it. I think it would fit right in with vanilla. In addition to this, I think "tripwire hooks" should be renamed to just "hooks" so that 1.) they make more sense to be used in this scenario, and 2.) they make more sense to be used to connect minecarts (hooks > leads). Makes sense, though for the sake of simplicity a lead should be all that's required to connect minecarts (or perhaps a chain?). Question: Where would people like to go regarding development next? We already have a solid idea of what the ocean and nautical matters will look like; I think it's worth taking a break from civilized NPCs and their features to look at natural environments and things like dungeon variants. I think we should start by focusing on caves, seaming as it's a popular topic for suggesting currently (not on these forums, but elsewhere). Pumpkin pie can be placed and eaten just like cakes. Spiders & cave spiders slip when trying to climb glazed terracotta or a kind of ice. Hey, I just wanna say thank you for showing interest in my old suggestion! Wish you the best with your mod. What should we consider for dangers in the ocean? GENERATION 678: The first time you see this, copy it into your sig on any forum and add 1 to the generation. There's already the drowned, but I think it should be changed to have the role of ocean floor danger and island danger. (From what I've heard, they spawn a bit too much. Keeping them at the ocean floor and on islands would solve a lot of this. Also, while on the topic of drowned improvements, I don't think they should have infinite trident throws. Maybe they have just one and they go and pick it up to throw it again. If this were implemented, 30% of drowned that have tridents could spawn with loyalty tridents to add back some of the difficulty.) I'd rather like to see Drowned with various weaponry (representing that they are drowned bodies and not just random corpses). "Ancient Drowned" with tridents would be a good start (maybe as skeletons? ), Drowned pirates with swords, pistols enchanted to fire underwater, and other things around shipwrecks would be interesting too. Sharks? (We can just... not mention this one in the discord if we decide to add it.) Eh... Sharks seem boring. I'd suggest giant squids and other threats instead. Axodile? (It's already being made into its own mod, though, so this might not be the best choice.) Right. Best not to step on the toes of other modders. Serpents? Sea snakes would actually be pretty interesting. I like it. Redstone eels? (Like electric eels) Okay, this is downright hilarious. Motion to add! Mob A? Sounds a bit uninspired but I think adding all of the Mob types would be a nice bit of gameplay addition for the mod. Ok. I agree that drowned would be more interesting with more weaponry. I also think it would be cool if drowned could sometimes have coral fans growing out of them. Redstone Eels are wicked beings that inhabit the deep ocean floor. They are able to harness the power of redstone and are hostile on sight. Eels attack like most mobs, but they only deal 2 HP per hit. What you’ll want to look out for is their shock attack. Occasionally during the fight, they will be stop attacking an expand inward, as if taking a deep breath. They will then release a wave of energy, with a radius of 4 blocks. All water blocks get a temporary hint of red as redstone flows through the environment. You will be unable to move for 1 second from the shock. During this time the eels who shocked cannot attack (but other enemies can). You need to stop the eel from pulling off a shock at all costs. Eels will typically spawn alone, but sometimes one might find an Eel Nest. These nests are hidden in small caverns at the bottom of the ocean. The main “room” is circular and small, home to two eels. This is a tough fight, as the small space makes it impossible to outrun the shock attack and two eels together means the other can attack while you’re shocked. But if you can win you will be rewarded with Eel Eggs, the antithesis of Turtle Eggs. Unlike Turtle Eggs you won’t need to wait for Eel Eggs to spawn, just right click them as you would chicken eggs. Eels are still hostile, so you’ll need to put them in a safe enclosure. So why put all this time into a pet that tries to kill you? Well, you can use Redstone Eels to transmit power through water! Eels are always checking if there’s a powered redstone line within a 4-block radius. If there is, the eel will automatically go into shock mode and stay that way until the current dies. If the eel’s 4 block radius connects to another unpowered redstone line / device / eel it will provide power. This allows redstone currents to run through water. I really like this idea. 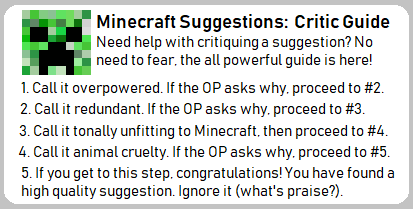 I don't think we should stop here, though, because the above-ground has multiple hostile mobs, so I think that should be applied to the oceans. Similar to how there are husks in deserts, I think there could also be unique mobs in, say, the frozen oceans. Angler fish could also spawn in the deep ocean trenches, which could try to knock you into the bubble columns. The truth is that with the drowned, the pupperfish and the already old guardians, I already have enough. But I think you should get poisonous or spiked seaweed. It would be something like cactus. Personally I feel that strictly hostile mobs need to follow fantasy theme for them to be vanilla-style. I mean sure spiders and silverfish exist in real-life, but the immense size of these invertebrates in Minecraft is clearly inspired by fantasy works like Tolkien, and Pufferfish are technically neutral mobs. To that end, I like the serpent idea. Giant squid could be reworked into a kraken. And of course any original mob works just fine. I agree. I really like the idea of giant squid, especially since we have moving ships. Perhaps the giant squid (kraken) could attack your ship sometimes. I am really enjoying the stuff people are generating here. The ocean in particular will be one amazing place to visit with this mod. I'll remind everyone that the Google Docs for the project are available on the OP and anyone is welcome to add content to the sheet for discussion. To prevent the forum thread from becoming horribly out of sync with the documents, I hereby request that any suggestion posted here be mirrored on the Concept Sheet or Detailed Content List, at least a copy/paste at the minimum. Since we can discuss and later remove things found wanting that were initially added, there is no harm in placing something down for consideration. Further discussion at the Abnormal Mods Discord (with our very own section) would be highly appreciated; once proper development begins this would be our primary channel. On the subject of mod development itself, 1.13 is now out; I haven't quite checked yet, but I assume we're nowhere close to Forge being updated for this yet. Once it is, there is nothing stopping the beginning of actual coding, asset creation, etc; until then, we are still restricted to refinement. While I certainly don't want to silence discussion on it, I would request that once the present ocean ideas are added to the documents, we change the subject to some of the more poorly filled packs (whichever people would like to take a look at). I am considering making weekly/biweekly "themes" for development (similar to what the MC Abnormals subreddit does) to centralize this. The existing Magma Kraken mod proves that a giant squid would not at all be impossible. Were we to acquire permission to use it directly, a simple reskin and modification of its behaviors would suffice for seafaring battles, though I wonder how performance would go with a giant ship, a crowd of Villagers, the player, and a giant squid all fighting. Community revamp is quickly transforming into a massive collaborative suggestion. It seems we are going to end up creating most of the content by ourselves, rather than picking and choosing what should stay and what shouldn't. I suggest we return the Community Revamp to its roots, linking old suggestions and debating whether they should be added. The direct additions can be turned into complete suggestions, for example the dungeons could easily be posted by themselves on the forum. If we still need to brainstorm, we could always create Collaborative Suggestion pages similar to the Frist. Direct additions are dangerous, because there's only a select few who visit this page as opposed to the many who view the subforum. We wouldn't want to add something almost everyone dislikes. Splitting things up would also make this project easier to handle. We would have to make a plan. A user should look for old suggestions and PM to other members the link. Then we could implement it in Frist. Hey there, I just stumbled upon this thread yesterday. What you guys are working on sounds amazing. I think I could help with finding suggestions if it's okay with you. GENERATION 22: The first time you see this, copy it into your signature and add 1 to the generation.